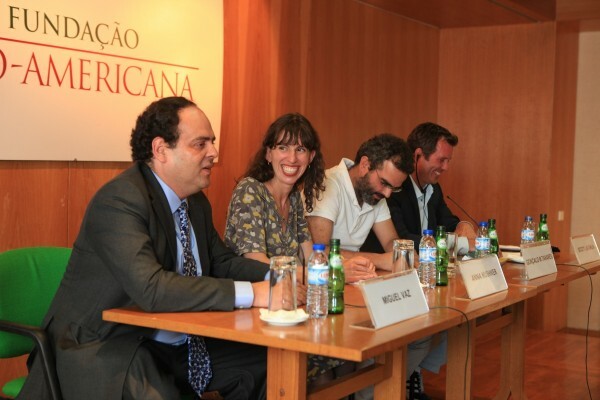 FLAD Director Miguel Vaz, translator Anna Kushner, Goncalo M. Tavares, and DISQUIET Associate Director Scott Laughlin during DISQUIET 2012. Centro Nacional de Cultura (CNC) was founded in 1945 as an “intellectuals’ club” in which to exchange ideas. It was the brainchild of a group of monarchists who wished to defend a free culture. Throughout the 50s and 60s it developed to become a democratic forum and by the late seventies, after the 25 April 1974 revolution, it began a new phase under the team leadership of Helena Vaz da Silva. It now includes a range of activities addressed to a broad spectrum of the public – Sunday Walks, travel, training courses, international meetings and seminars, exhibitions, publications, literary and artistic competitions, prizes and grants, children’s activities, providing cultural services for schools, corporations and foreign groups visiting Portugal. Currently CNC’s main objectives are to promote, defend, disseminate and register Portuguese cultural heritage, promote “cultural tourism” based on an integrated idea of tourism, environment, heritage and cultural itineraries, and to educate the younger generations on a feeling of global citizenship. Its action can be summarised as a policy of “establishing contacts,” “articulating,” and “making things happen.” A sattelite was opened in 2006 in the city of Oporto.